Sometimes you see something in the store and you can’t help but pick it up. I have had an iron will with certain items but something about a lunchbox that is just the entire face of the Hulk screamed “Bring me home!” There isn’t much else to say about this other than you should totally pick this up. I’m psyched to see what Marvel has in store for us as far as merchandise goes when Thor 3 comes out. A lunchbox like this with the gladiator helmet? Just take my money! These 2 thermoses are great. The one with the blue top features a Spiderman and Captain America as well. The one with the green top is all Hulk, baby! You can see The Leader’s name and part of his arm on the side. I got the blue top at a flea market and the other in a comic shop in Malden. These are the Luck Boxes I have so far. Most are novelty lunch pails, not really used for lunches. 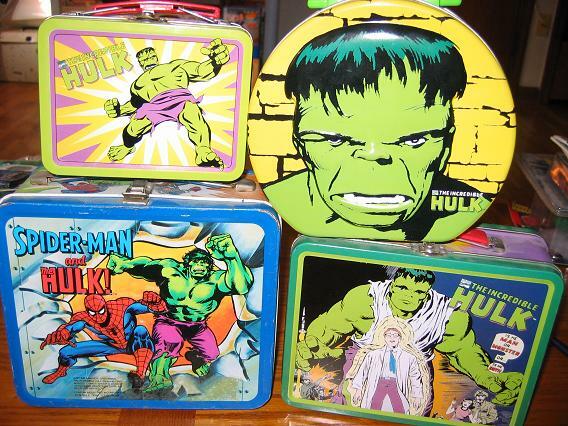 The only genuine lunchbox in this set is the metal one with Spiderman and the Hulk on it. The otherside features Captian America, who died this year, so it’s not a real HULK lunch box. I’ve seen many of these on ebay going for waaaayyy too much, so I will wait and see what comes my way. 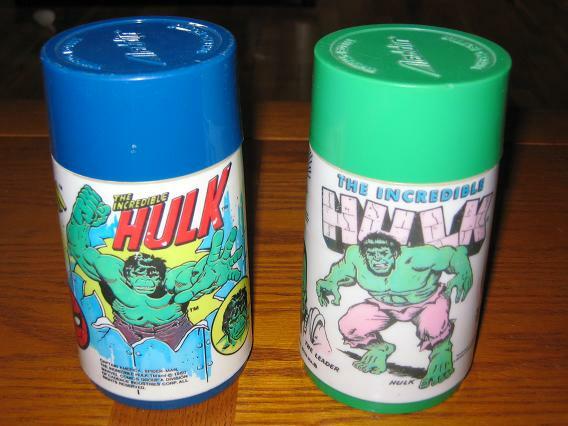 Notice the re-coloring of the Hulk from grey to green on the lunchbox featuring Incredible Hulk #1? They do that a few times with items that I have. Boo to that. It’s like when they go back and colorize old movies. It just shouldn’t be done.